Building custom decks and porches in Lenexa KS since 2001. 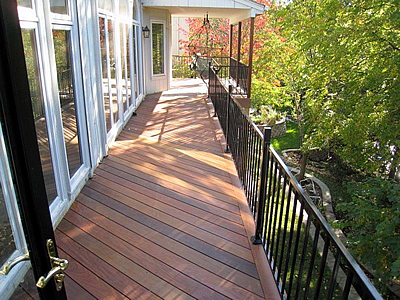 Archadeck of Kansas City has been designing and building custom decks and porches in Lenexa and the Kansas City area for over 18 years, including wood and low-maintenance decks and deluxe open and screened porches. When it comes to bringing dream outdoor living spaces to reality, our experience, award-winning designs, and reviews speak for themselves. We have an enduring reputation for providing beautiful and functional outdoor living spaces throughout the Kansas City area. We endeavor to create spaces that will optimally serve the specific needs of each client, giving them best quality time outdoors, and no two Archadeck of Kansas City outdoor living projects are the same. Whether you are looking to build a new deck for outdoor entertaining, a screened porch for private relaxation, complete with a custom outdoor stone fireplace, or a 4-season room that you can use, even when it’s cool outside, we aim to help you achieve your perfectly personalized outdoor living design. Cozy elevated Lenexa screened porch with outdoor fireplace. Archadeck of Kansas City aims to be your first choice for a Lenexa deck builder. More and more Lenexa homeowners are seeing the benefits of having a custom deck designed specifically to their design and usage specifications. 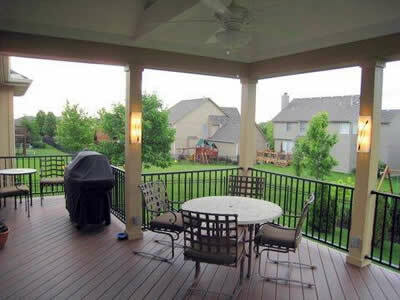 One very popular choice for custom decks in Lenexa is a low-maintenance deck. Low-maintenance decks offer several advantages, including many finish choices, including an array of wood-look colors and textures. They offer longevity with fade resistance, maintaining their beauty for many years. Busy families today enjoy the benefits of not having to perform annual maintenance, which might be required of a natural wood deck, including sanding, staining, or painting. This Lenexa KS low-maintenance deck and screened porch is spacious enough to have multiple outdoor living areas, including space for a large outdoor dining table and chairs. 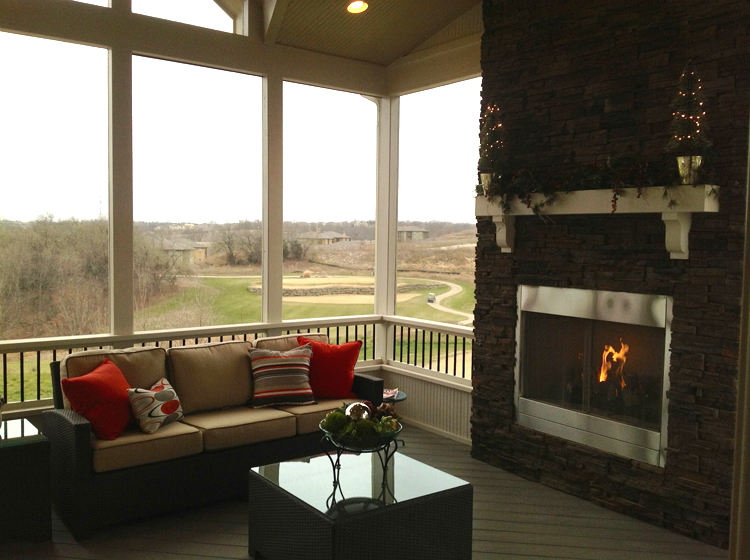 These Lenexa homeowners chose to maximize use of the outdoor spaces by screening in a large portion of the deck. Screened in spaces offer homeowners the option to be outdoors during inclement weather, and when pests might keep us from using an open-air space. There is a low-maintenance deck, which is also natural wood! It is possible to have a natural wood deck that is beautiful, long-lasting, and low-maintenance to boot. The wood is Ipe Brazilian hardwood, and it’s gaining popularity in the Kansas City market. This exotic hardwood has a hardness rating of 3700, compared to western red cedar, which offers a rating averaging 700. 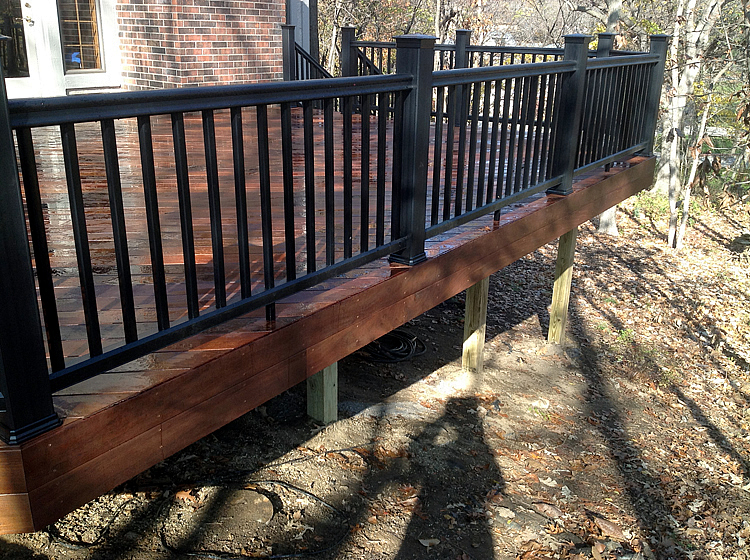 Read more about this Lenexa Ipe deck! Depending on your aesthetic preference and environmental elements, any type of wood deck will require periodic maintenance, on average every one or two years. If you wish to keep the rich color of this gorgeous wood, your maintenance will be in resealing, rather than staining. Oil is required to seal an Ipe deck to keep its color. However, if you prefer a natural, weathered appearance, you can allow your Ipe deck to fade over the years, aging to a light gray finish. Either way, Ipe is a solid choice for your new Lenexa KS deck. Screened porches are popular in Lenexa for many reasons. 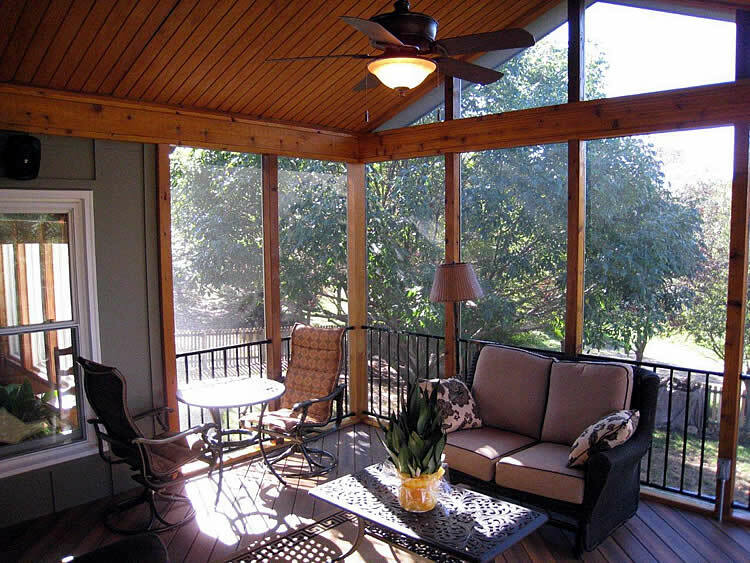 Screened in porch designs offer a roof for shelter from the elements and screens to keep out pests, all the while giving more opportunities for homeowners to bring their comforts from inside to the great outdoors. 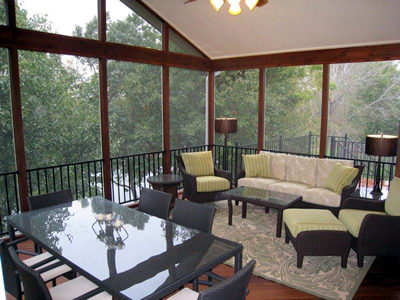 Screened porches of today are truly customizable to accommodate any outdoor living style. From the simplicity of only offering a roof and screens, to the more elaborate amenities, such as custom-finished ceilings, electrical hook-ups, and outdoor fireplaces. 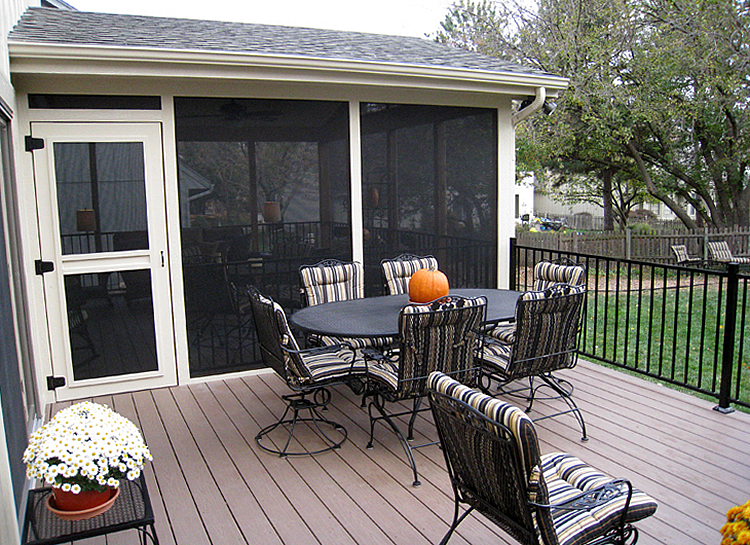 These deluxe screened in porches are very common in the Kansas City market, because they are more usable throughout the year. Heating sources, like fireplaces and space heaters are keeping Lenexa residents outdoors for more hours each year, even when the weather is cool or inclement. It is very common to see outdoor televisions, comfortable furnishings, stylish and functional lighting, ceiling fans, and even surround sound speakers in Lenexa screened porches today. 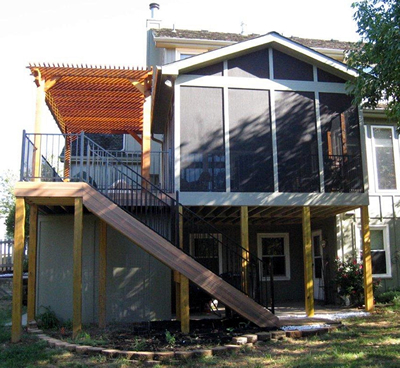 Your imagination is the limit when it comes to customizing your new screened porch! This bright and airy Lenexa KS screened porch design comes complete with a finished beadboard ceiling, multiple ceiling fans, and lighting. There is enough room on this beautiful porch to eat, relax or have conversation in a seating area, and even to enjoy the porch swing. 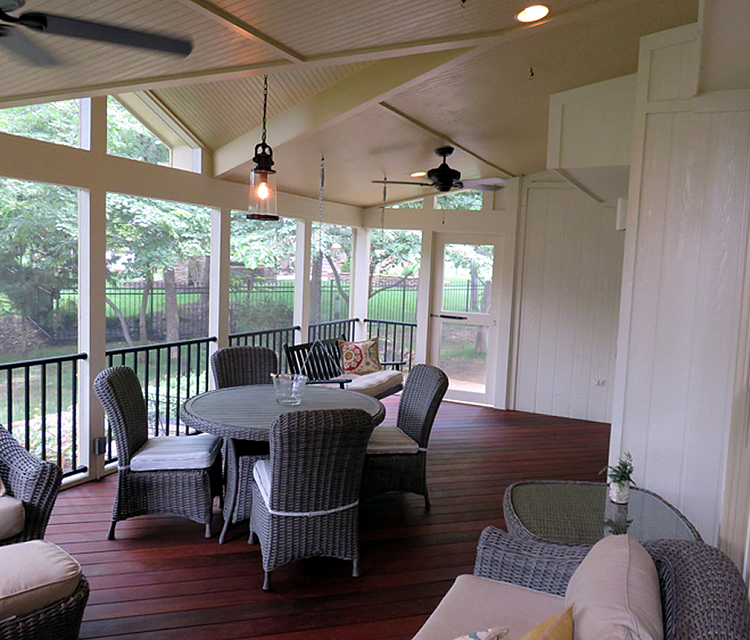 This porch also includes low-profile metal picket railings and an Ipe Brazilian hardwood floor. The benefits of a tall open gable roof are two-fold. First, they allow for great airflow, perfect for warm summer days. They are also perfect for those, who want maximum light entry. 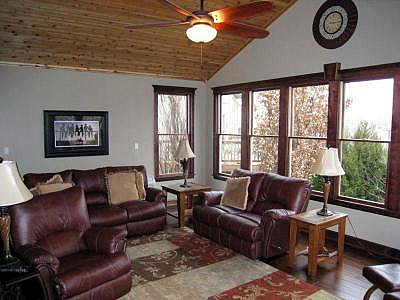 Notice how even though this porch has a rich color palette, the space is still very bright with natural light! Open or covered porches of today have come along way too! People are finding better ways to use their open porches with options similar to that of screened in porches. Electrical hook-ups, low-maintenance materials, and comfortable furnishings create inviting outdoor spaces. 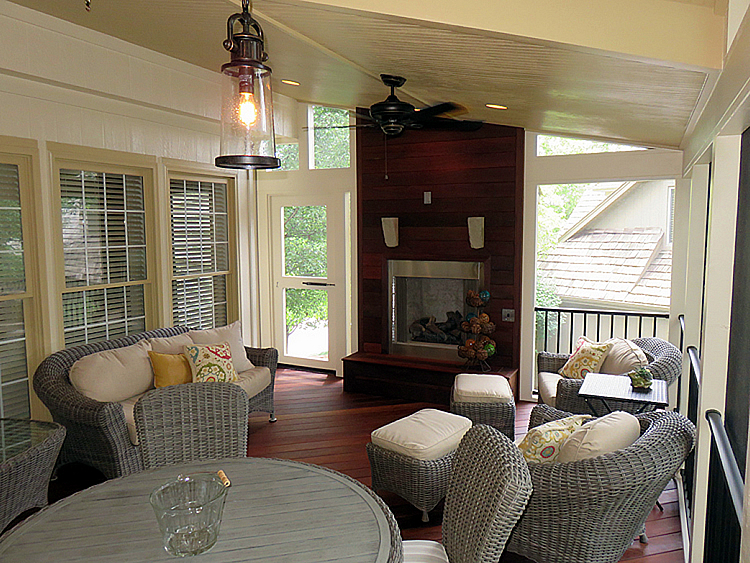 This open porch design in Lenexa KS not only has electrical for a ceiling fan and lighting, but these homeowners chose to make their porch more usable by adding a low-maintenance grill deck. This elevated porch design naturally provides a covered space underneath for storage of outdoor items. Notice the diagonal orientation of the low-maintenance porch floor and grill deck, which gives this Lenexa porch a true custom aesthetic. The stylish post-mounted sconce lighting will add an ambient glow after dark. The entire space is enclosed with low-maintenance powder coated metal railings. 4-season rooms offer Lenexa homeowners the feeling of being in an outdoor space any day of the year. These are actual room additions with large windows, complete insulation, and a heating and cooling source. Some homeowners choose HVAC, while others prefer split heating and cooling units mounted on the wall. This Lenexa 4-season room has a finished gable ceiling and includes insulation to aid in using the room throughout the year. The screened porch below has a beautiful open gable roof. Having the gable open with screens in the gable allow for more air circulation and optimal light entry. The low-maintenance deck and porch below illustrates the benefits of adding a pergola to your deck. Pergolas provide partial sun protection, so you can use your deck, even in full sun, while still having the feeling of a true open-air space. The beautiful Lenexa Ipe wood deck below features a walkway to an open porch. The Ipe decking flows between the two spaces beautifully. A low-maintenance metal railing encloses this elevated deck and porch design. 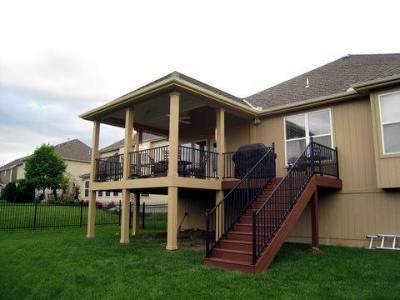 The color variation on this Lenexa deck and porch design illustrates the true beauty of Ipe. The views from this elevated outdoor living space will remain open and beautiful by way of low-profile black metal railing, which draws the eye beyond to the beautiful yard. With an A+ rating by the BBB, you can trust Archadeck of Kansas City to provide top-notch outdoor living design and build services. You will be pleased to recommend us to family and friends.